In the field of electronic cooling, it is now becoming widely accepted that liquid cooling is a much better technology solution, compared to air cooling. Despite the advantages of liquid cooling, ‘hybrid’ air-liquid cooling systems are used at some data centres. Hybrid cooling systems rely on liquid to remove heat produced by the high power components, while the remaining low power components are cooled by air. Nonetheless, the miniaturization of electronic components is creating new demands for liquid cooling systems, particularly integrated systems that have minimized external connections. Achieving integration though presents its own challenge for existing liquid cooling systems. Most of them rely on external pumps, connecting tubes, and micro-fabricated heat sinks that can only be re-engineered at some cost. This year, two start-ups introduced new liquid cooling designs based on ground breaking innovative technology championed by the Open Compute Project (OCP). 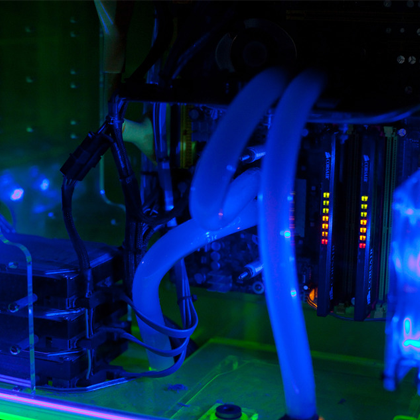 This is an open hardware initiative which is working to enable wider adoption of liquid cooling, citing demand from hyper-scale computing providers, as well as new applications in edge computing. Google has now adopted liquid cooling for its artificial intelligence hardware. And last year the OCP created an Advanced Cooling Solutions project in response to industry’s need to collaborate on liquid cooling. One start-up, Submer Immersion Cooling, showcased its wares at the recent OCP ‘Summit 2019’ in San Jose. Its immersion cooling tech can manage extreme power densities exceeding 100 kW. And it says it will increase the lifespan of IT hardware by 20% to 50%. Servers are inserted vertically into dielectric fluid in Submer’s enclosures. The SmartPodX platform can accommodate either standard 19-inch mountain rails or the 21-inch rails used by the OCP. Submer says it has deployed “several megawatts” of SmartPod immersion cooling capacity since launching last year, supporting workloads for HPC, telecom, energy, colocation and blockchain customers. One of its most high-profile deployments has been at CERN, home to the Large Hadron Collider. Israel’s ZutaCore has developed its ‘HyperCool2’ technology, which it claims is the first liquid-cooling solution that is compliant with the Open19 standard for data centre hardware championed by LinkedIn. The system is similar in configuration to traditional liquid cooling. However, ZutaCore uses a two-phase cooling, whereby heat from the chip is dissipated through liquid contact and the liquid is vaporized by the heat. The cooling system consists of a server kit that includes the Enhanced Nucleation Evaporative (ENE) module and a closed loop system that brings coolant to the processor, where it boils to remove the heat. The system also features a Smart-Refrigerant-Distribution Unit (S-RDU) and Smart-Heat-Rejection Unit (S-HRU), and a software package to manage the system. In other developments, the US based industrial conglomerate, 3M Company, demonstrated in February how a PC could be cooled using its own brand Novec® 649 liquid. This engineering fluid has a boiling point of 49°C and was recently the subject of a successful independent trial whereby a 25.4 mm square heat source was placed in a bath of Novec liquid in a two-phase immersion cooling. Intel and SGI have already trialled this method of cooling servers and supercomputers using 3M’s low-boiling-point dielectric liquid. “With a wide range of boiling points, low viscosity and high dielectric strength, 3M Novec Engineered Fluids are suitable for cleaning, heat transfer and other applications,” claims 3M. ‘HyperCool2’ uses 3M’s Novec dielectric liquid coolant, rather than water. Meanwhile, research carried out by Jiu Yang Zhu, Shi-Yang Tang, Khashayar Khoshmanesh, and Kamran Ghorbani at RMIT University, Melbourne, Australia on a liquid cooling system, demonstrates what they promise is a cost effective solution. They showed that placing a small droplet of liquid metal Galinstan over the hot spot energized the liquid metal droplet, thereby creating a surface tension gradient across it. This induces a ‘Marangoni’ effect over the surface of the droplet that produces a high flow rate of coolant medium through the cooling channel. The high thermal conductivity of liquid metal extends the heat transfer surface and facilitates the dissipation of heat and enables the rapid cooling of localized hot spots. “Our technology facilitates customized liquid cooling systems with simple fabrication and assembling processes, with no moving parts that can achieve high flow rates with low power consumption,” claim the researchers. The increase in computer density will continue to make air cooling less and less feasible, compared with liquid cooling. Between 2018 and 2023, the engineered fluids market is projected to grow at a CAGR of 8.8% to reach $1,304 million, from $854 million in 2018, Out of all the market’s sub sectors, it is the heat transfer fluids (cooling) segment that is expected to register the highest CAGR.